﻿﻿ Even as an adult, my favorite place at Disney World has got to be the Magic Kingdom. It's just the best, hands down. This was my first trip to the Magic Kingdom as a parent though. Our daughter was 16 months old for the trip. 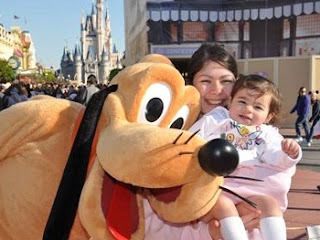 I'll be honest with you - if you're planning a Disney trip with a toddler you will hear people ask why? isn't that too young? will they even remember it? Don't let these people get to you. You're going to Disney World because it's the world's best family vacation destination. There is no such thing as too young for Disney World (in fact, I was surprised at how many 2-3 month infants I saw here!). Will they remember it? Probably not in detail, but rest assured mom and dad will, and the memories are some of the sweetest that you'll ever have. And that is what really matters. I personally thought that 16 months was the perfect age for a first trip to Disney World. The attractions, parades, food, characters, shops and sites of the Magic Kingdom make it perfect for children of all ages. Here's our "Hot Tips" for taking your toddler! Upon arrival, head up through the castle to Fantasyland. Right away you'll want to get a FASTPASS for Peter Pan's Flight. It's pretty normal for this ride to have a wait from 30-90 minutes. Since strollers are not allowed in line, this can be a pretty grueling experience with a toddler. You'll also want to get a FASTPASS for The Many Adventures of Winnie the Pooh. This is a fun, musical adventure recalling some of the classic Pooh stories. Mickey & Minnie Mouse are often posted by the restrooms near the Exit of Splash Mountain. We visited the characters here several times and the line was never very long. The fastest way to zip up Main Street on a crowded day is to go through the shops up the left side of the street. They are all connected and usually not very busy early on in the day. Bonus: air conditioning! 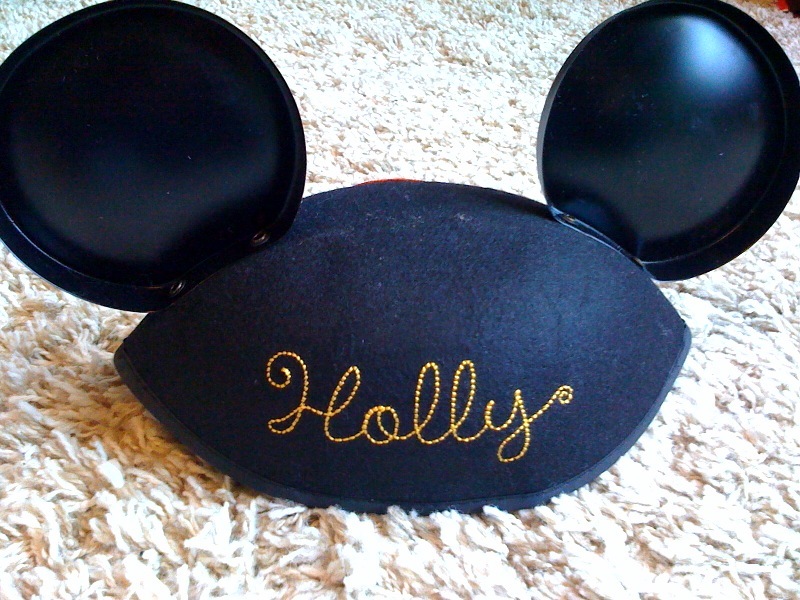 Personalized Mickey Ears run $15+ at Chapeau on Main Street, right near the confectionary. The wait time here was around 10 minutes for personalization, whereas we found that the well known hat shop at Disney's Hollywood Studios often had a pick-up time of several hours later. There are plenty of rides and shows for toddlers at the Magic Kingdom park. Remember to take breaks often. The stimulation can be really exhausting for the little ones! Walt Disney World Railroad: This railroad travels the outside perimeter of the Magic Kingdom, and takes approximately 20 minutes round trip. If your toddler is not one to fall asleep in their stroller, try taking a ride on the Walt Disney World Railroad. It's relatively quiet and you can stay onboard for as long as you like. Swiss Family Treehouse: Visit the home of the Robinson's! This amazing tree has bedrooms, a library, even a kitchen! Note: No strollers allowed on this attraction. The Magic Carpets of Aladdin: My daughter loved this ride. Much like the Dumbo ride, this attraction goes up and down and gently round and round. I loved hearing my daughter say "Weeee! Weeee" as we rode around Adventureland. The lines are much shorter around mealtimes. Jungle Cruise: A fun, relaxing boat ride for the little ones, a silly safari for the adults. Everyone wins. Pirates of the Caribbean: Older toddlers may find this find to be scary. My 16 month old daughter was a little unsure at a couple points, but mostly just mezmerized at the "doggy" with the key. Country Bear Jamboree: Exactly how I remembered it as a child. This fun animatronic show features bears of all shapes and personality in a 17 minute musical show that kids will love. Haunted Mansion: Again, this attraction might be scarier for older children. I think unless kids have it put into their minds that this is supposed to be "haunted in scary" then it's really harmless. Our daughter thought it was great, especially the ghosts ballroom dancing. "it's a small world": In my mind, the best attraction for toddlers in the Magic Kingdom. This boat ride will take you around the world, and there is so much to explore! Because there is so much to see, this is one ride your little one will love doing over and over again - making it a new adventure each time. Peter Pan's Flight: Fly along with Peter Pan as he takes us through the classic story. Snow White's Scary Adventures: We did elect to skip this one, as I thought the witch might really terrify my daughter. The Many Adventures of Winnie the Pooh: I was at first sad that Mr. Toad's Wild Ride wasn't around anymore, but this is a suitable replacement for today's generation of Disney kids. Mad Tea Party: Who doesn't love a spinning teacup? We didn't think our daughter was quite ready for this one either, but it is great fun for older toddlers. Monsters Inc. Laugh Floor: This comedy show in Tomorrowland is fun and suitable for all ages. It's interaction with the audience will keep the adults entertained and the animation and effects will keep your toddler in tow. Other: There is a stage that is just right of Space Mountain in Tomorrowland. Several times a day during our visit, some of the Disney Characters (Goofy, Pluto, and Stitch) would host a "dance" party here, performing both on stage and in the crowd with the kids. We ran into this party by luck, and it was one of the most fun things for our daughter for the whole week! Right now Disney is showcasing a fun, music filled day-time parade in the Magic Kingdom called Celebrate a Dream Come True Parade. Parade times may vary by day and season. This character filled parade is camera worthy and is sure to make the kiddos smile. The parade route is either from Main Street up through Frontierland or vise versa (see schedule). ﻿﻿﻿We found that a great place to view this parade is on the street right in front of the Country Bear Jamboree in Frontierland. ﻿Plan to line up for the parade about 45 minutes in advance for a good spot. If the kids are restless, have an adult take them in to watch the Country Bear Jamboree while another adult stays with the strollers/saves your spot. When night falls, you don't want to miss the Main Street Electrical Parade. ﻿A Disney favorite for years, the music and (most of) the floats are still the same as they were when I was a kid, which is the perfect way to bring back all the magic again. Times vary by day/season. Check the schedule upon arrival. It is worth keeping your little ones up late for this one! ﻿ Our favorite spot to sit for this parade is right in front of the Plaza Ice Cream Parlor. From here you'll have a fantastic view of the parade floats coming down Main Street, as well as a beautiful backdrop of Cinderella's Castle lit up at night. Aloha Isle: This small snack shop is located in Adventureland. If you like soft-serve ice cream and tropical flavors, you will NOT want to miss this one! They have the most delicious pineapple "Dole Whip" that will tingle your taste buds. Hosted by Dole. Pecos Bill Tall Tale Inn and Cafe: In the heart of Frontierland, this saloon style eatery has some of the best bbq sandwiches I've ever had. They also have the typical burger and fries fare, and of course, for the picky little eaters you can order pb&j. The dining hall is typically very crowded. If the second floor is open for dining make your way up there for a quieter experience. Columbia Harbour House: This quick service eatery serves fish and chicken baskets. Delicious foods, long lines. Have your party find a table outside and sit down while you wait. Cosmic Ray's Starlight Cafe: When everyone in the family is wanting something different to eat, Tomorrowland Terrace Restaurant is the place to go. They have three separate "Bays" in which to order different types of food from, from sandwiches and salads to specialty burgers and chicken meals, they pretty much have you covered. Relatively short lines, both indoor and outdoor dining available. Harmony Barber Shop is more than just a store-front ole-timey barber shop in the Magic Kingdom's Town Square - it's a real barber shop! For just $18, you can have a memorable first haircut that the whole family will remember, including a special certificate to take home, a lock of hair, and Mickey ears that have "First Haircut" stitched in the back of them. My 16 month old daughter loved this experience. From the dozens of stickers our stylist Yvette (whom I highly recommend) gave her, to the spinning Minnie toy she played with, AJ didn't even notice that she was getting a haircut. She did such a good job, and we have some fantastic memories now. Reservations are highly recommended. Call 407-WDW-DINE (yes, you call the dining line for a haircut appt.) to make your appointment today. If you've been questioning whether or not to bring a stroller to Disney World, even if for your older toddler, the answer is yes, yes, and how could you ever doubt yourself? Strollers are key to a happy and successful Disney World trip. Pack yours along, because they aren't cheap to rent ($15/day for a single). There are designated "Stroller Parking" areas throughout the parks, and Disney cast members are constantly organizing and reorganizing the strollers so that they don't become a jumbled mess. We often came back to our stroller moved to a different location within the parking area, but with Mickey stickers (our daughter's FAVORITE) inside the seat. YES, bring your stroller! For more on traveling to Disney World with a toddler, please check out my other reviews. I hope you have the vacation of a lifetime! Disclaimer: I am in no way affiliated with Disney or Walt Disney World Resorts, other than a satisfied customer who likes to share her opinions! Wow, what a great trip and some wonderful tips!!! I can't wait to take Avery there eventually (and the new sibling, so it will probably be a while). I will definitely have to come back and read this again when we get around to going. Thanks!